On the cutting board, the Beef Bouillon, left, is served with the Whipped Bone Marrow Toast, above; On the right: Broek Pork Acres, Berkshire Pork Shoulder with Chewy Beets; On the bottom: Pacific Octopus Kushiyaki with a Black Garlic Glaze, and Fermented Seaweed Emulsion. Photography Cooper & O'Hara. 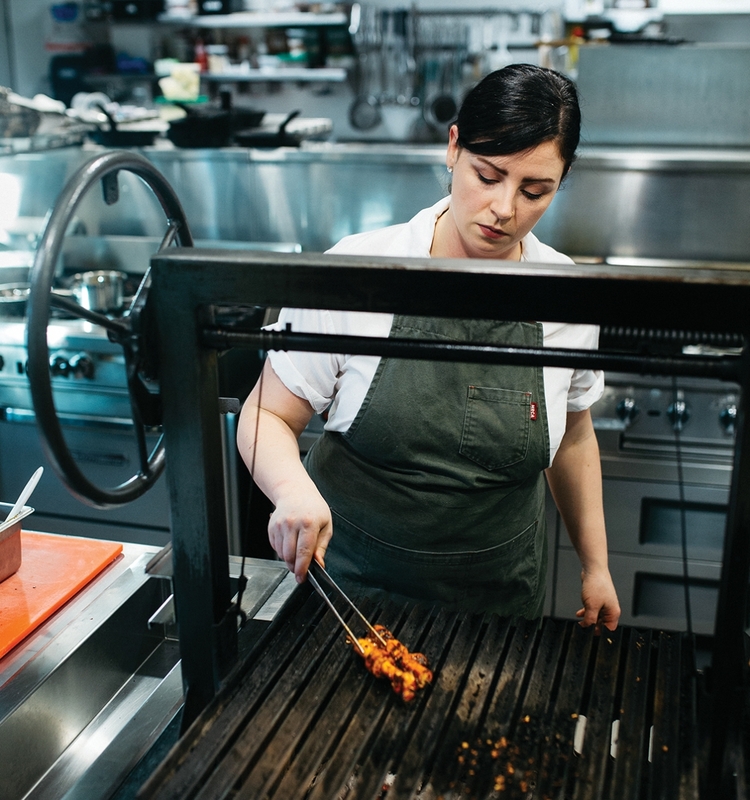 Chef Christine Sandford working the charcoal grill. 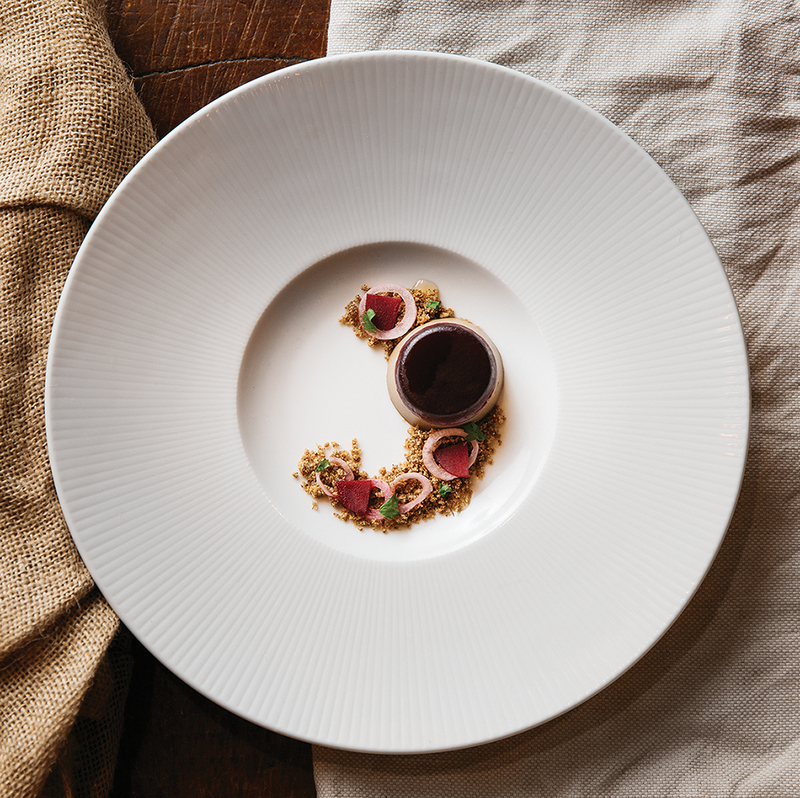 Biera has gone from our Best New restaurant in 2018 to our Best Overall for 2019 — a true testament to the innovative and ever-changing menu chef Christine Sandford has crafted. 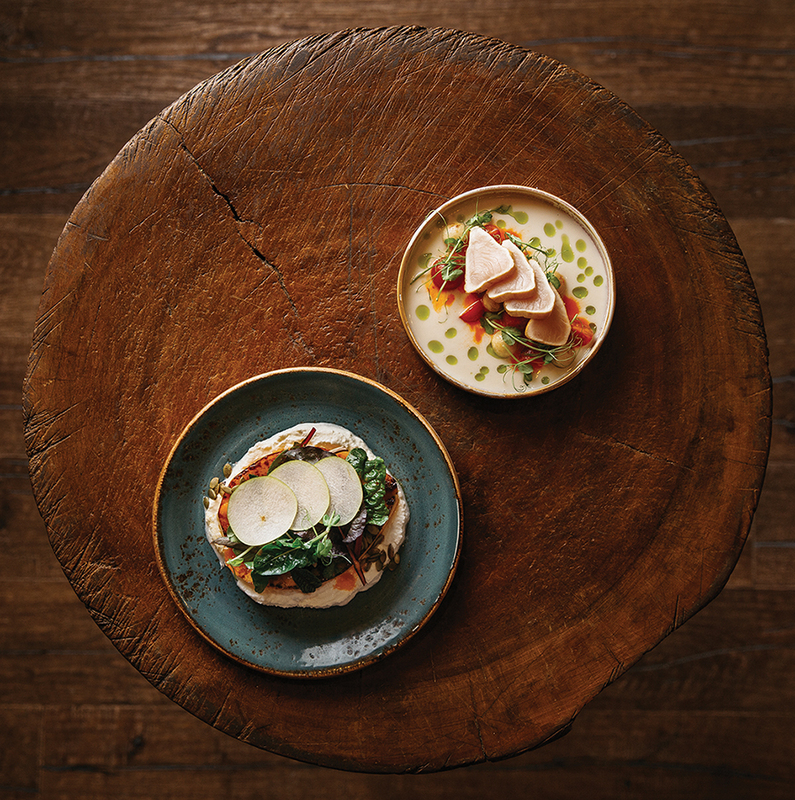 Whatever you order, you need to start with the sourdough, which has become a Biera signature. The bread itself comes served with house made kefir butter and whipped lardo, two decadent spreads that will delight your taste buds. Dishes are meant to be shared, and there are plenty of standouts. The yogurt gnocchi is so light and fluffy it practically melts in your mouth, and the crisp winter greens add a great textural complement. The leek and toasted bread bouillon it swims in is flavourful, yet doesn’t overshadow the delicate flavor of the gnocchi themselves. Make sure to get a few items from the charcoal grill as well. 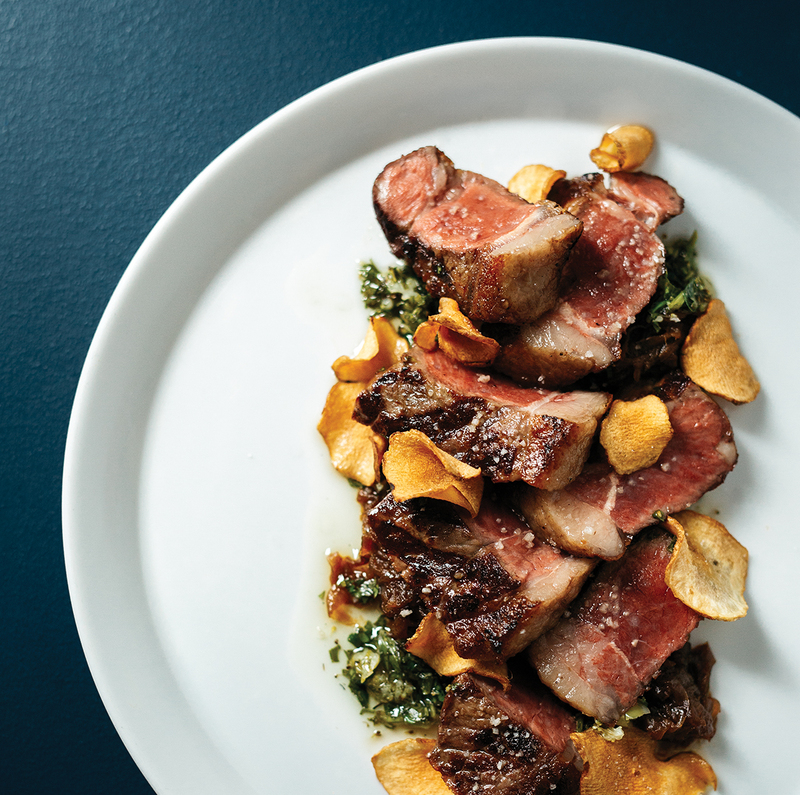 Biera sources its meats locally, and always includes intriguing components that take the meats to the next level, from red plum umeboshi sauce to elderflower verjus glaze. And, don’t forget to sample a few of the offerings from Blind Enthusiasm Brewing Company — with the “Sampledoodle” you can try four of the brews on the menu and pair them throughout your meal. – A.M.
Because Rge Rd only uses the best ingredients Western Canada has to offer, its menu changes based on availability throughout the season. That variety not only keeps things exciting for regulars, but also ensures first timers a taste of something they’ve never had before (and keeps the friendly, knowledgeable staff on their toes). The Kitchen Board’s selection of tasty bites makes for the perfect appetizer, the Grizzly Gouda & Potato Perogies taste better than home, and you’ll struggle to find better bison within the city limits. With pendant lights hanging from wood beams and woolly sheepskins draped over the chairs, the rustic ambience is part of the charm. – C.S. Roasted winter squash salad, cayenne vinaigrette, Winding Road yogurt and honey, shaved pea; B.C. Albacore tuna with a kohlrabi vichyssoise, marinated tomatoes and cilantro oil. Many restaurants burst onto the scene in a blaze of buzz and glory, they make a lot of must-try lists, then they fade out of the spotlight. Chefs leave, owners change. But, Cibo finishes in our Best Overall category for the fifth time in the last six years. Maybe it’s because chef Rosario Caputo has not compromised on any of his standards — from handmade pasta to curing the meats himself. 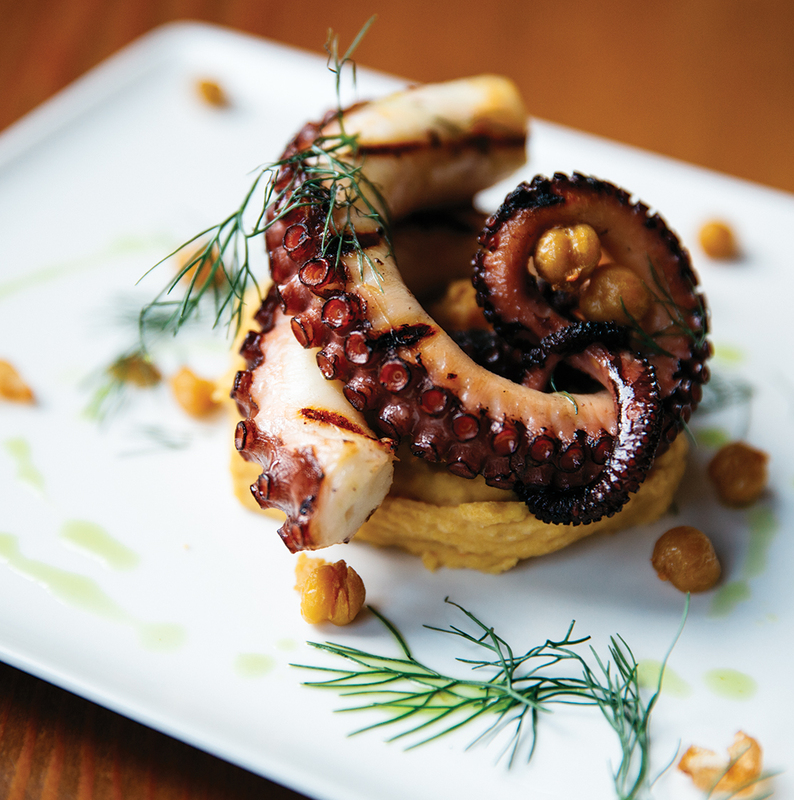 Cibo consistently scores well in our judges ratings — and that’s a testament to staying power. 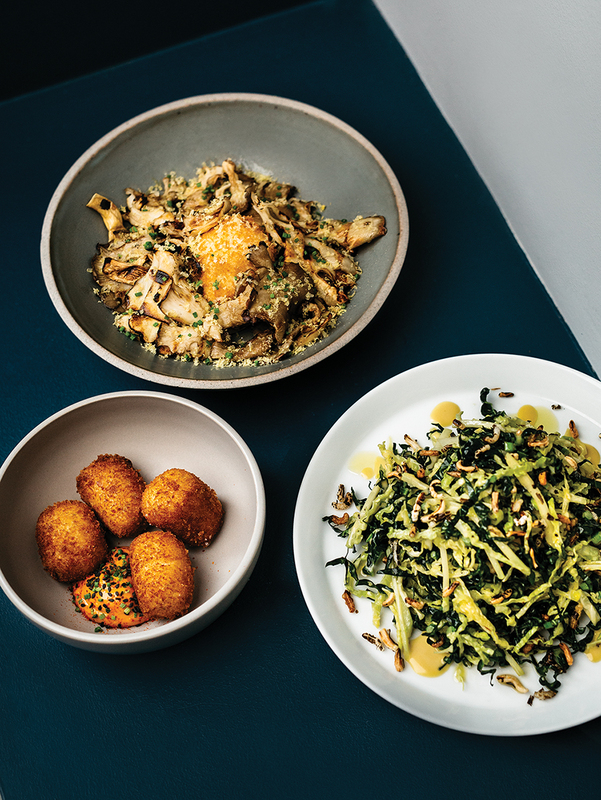 – S.S.
Clockwise from top: Grilled mushrooms, kale and cabbage, pommes Dauphine. 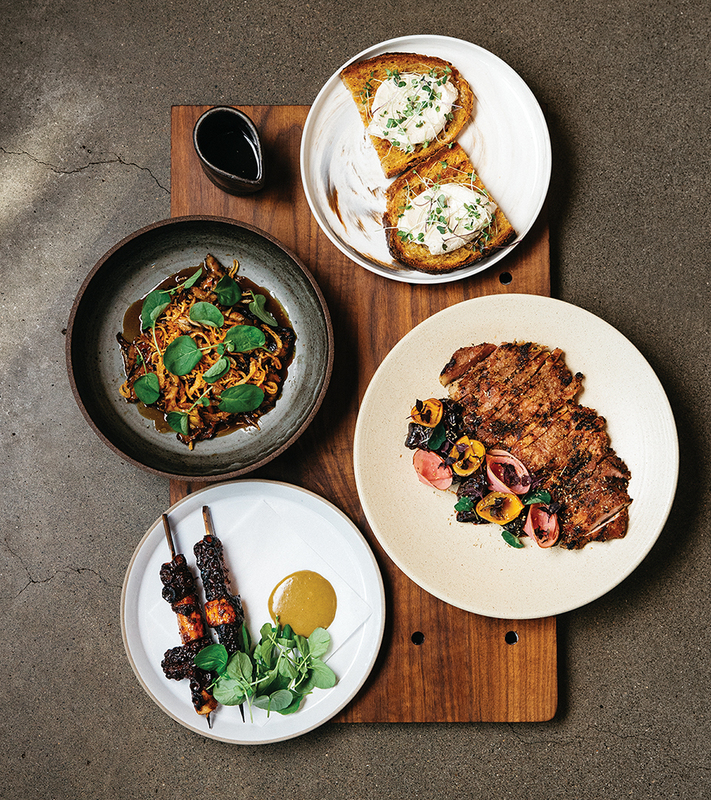 This downtown spot debuted on our Best Restaurants list last year, in the Best New category (as well as Best Sharing), and the inventive, delicious dishes that chef Ryan Hotchkiss creates have remained amongst our favourites for another year. The sea bream crudo continues to be one of the best bites in the city, period. There’s just something about the perfectly balanced combination of heat, freshness, and citrus, all highlighting the Effing Seafoods crudo. And, the roasted cauliflower drizzled with crème fraiche, topped with breadcrumbs and capers, is total comfort food — and manages to make vegetables feel positively decadent. Don’t forget to explore the carefully curated French and Canadian-focused wine menu for a few pairings. —A.M. Everything about Uccellino, from layout to menu, is modern and simple. The two-level, bright and open seating — half of which is kept for walk-ins — creates a contemporary chic atmosphere. 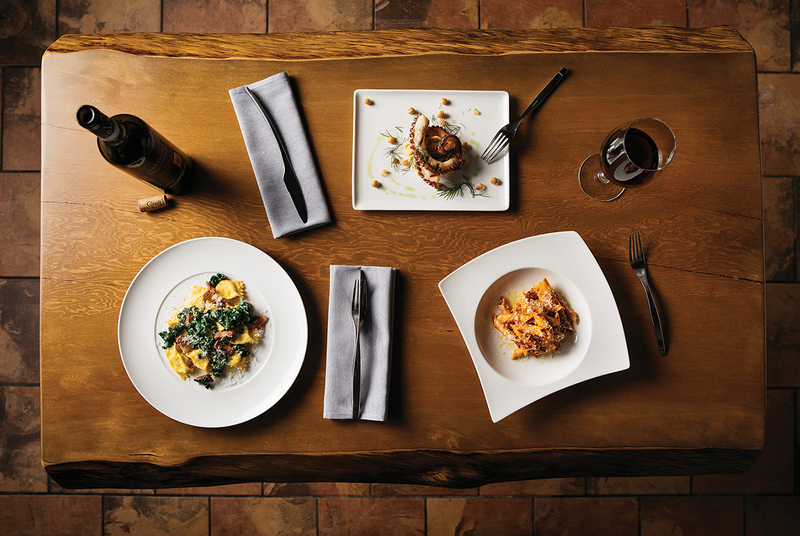 And the meals — from the Sicilian Anchovy & Butter Crostini, to the Ricotta Gnocchi, to the Icelandic Cod — are straightforward and scrumptious, made from either local or Italian ingredients, with a wine list to match. It’s like eating a meal made from scratch by the supremely talented Italian grandmother you wish you had. —C.S. This article appears in the March 2018 issue of Avenue Edmonton.